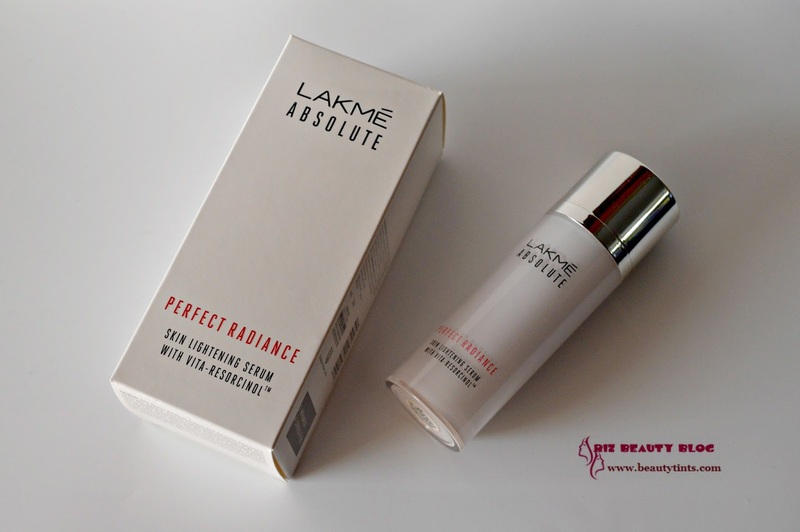 Sriz Beauty Blog: Lakme Absolute Perfect Radiance Skin Lightening Serum Review!!! 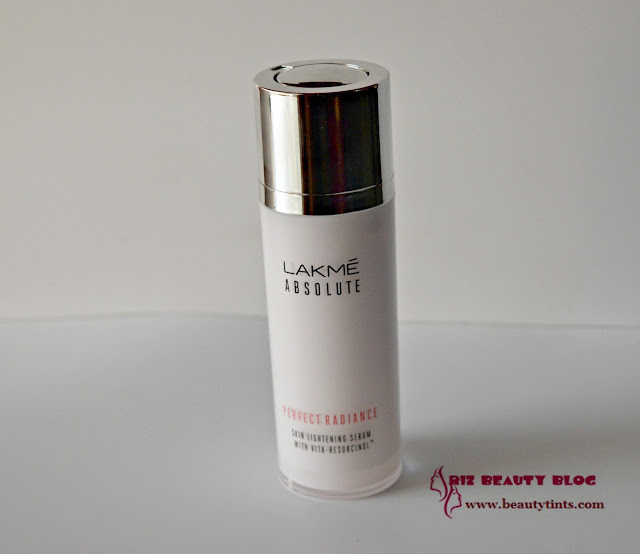 Today I am reviewing the newly launched Lakme Absolute Perfect Radiance Skin Lightening Serum,which I bought when it was on a good discount and have been using it from past 3-4 weeks. 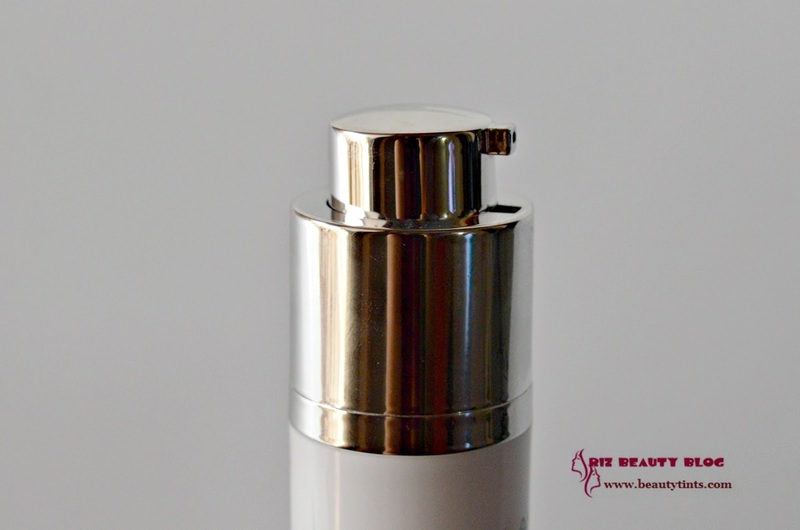 Packaging : It comes in a sturdy and classy white colored bottle with a silver colored metal twist up pump cap. 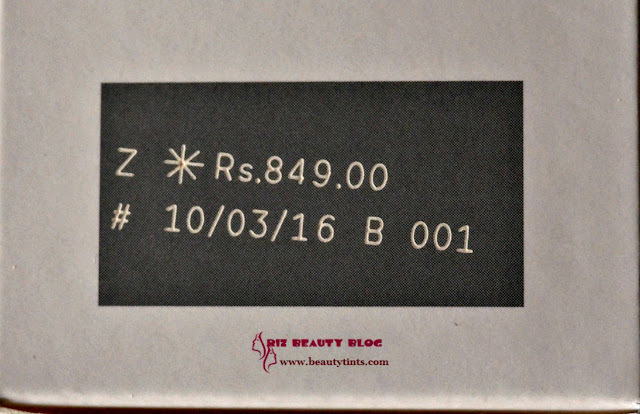 Color and Texture : This serum is white colored with pearly sheen which turns into light pink when comes into contact with the skin,similar to other serums from lakme. 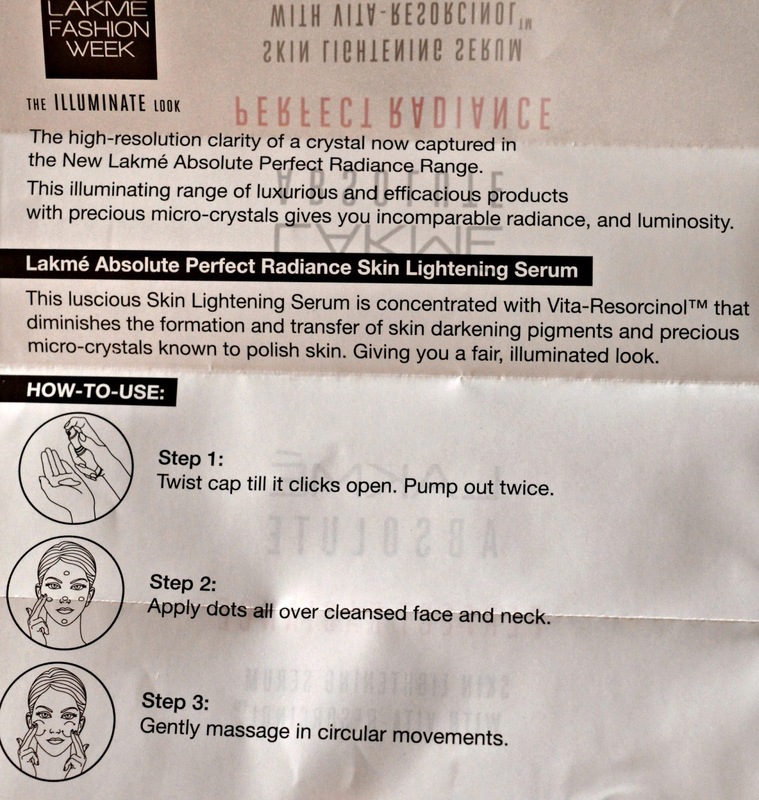 What Product Claims: Lakme Absolute Perfect Radiance range is enriched with micro-crystals & skin lightening vitamins that gives your skin a Hi- Res Crystal Radiance. The range has been designed to be in sync with the latest runway trend across the globe: Illuminate Look. 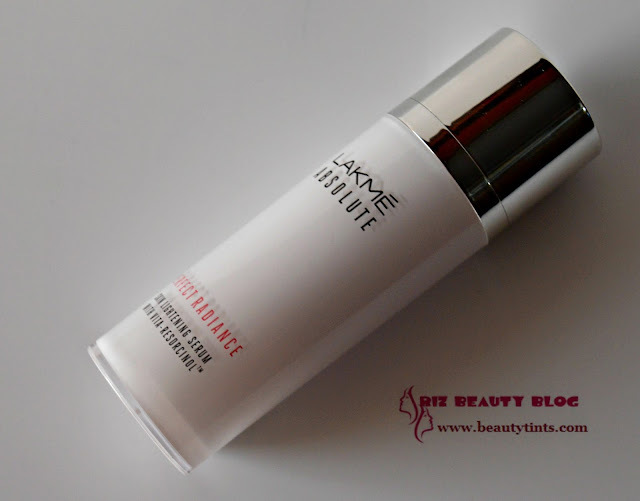 Give your skin a beautiful glow with Lakme Absolute Perfect Radiance Intense Whitening Serum. Infused with Vita resorcinol & micro-crystals it lightens & gently polishes your skin it and gives it an even tone. It also contains Vitamin B3, Vitamin C, and Vitamin E for optimum nourishment. You can use this after cleansing and hydrating and before applying makeup. You can also team this up with other Lakme products for a perfect look. So get your skin that special glow, whether for a party or that intimate dinner; with Lakme Absolute Perfect Radiance Intense Whitening Serum, right away. 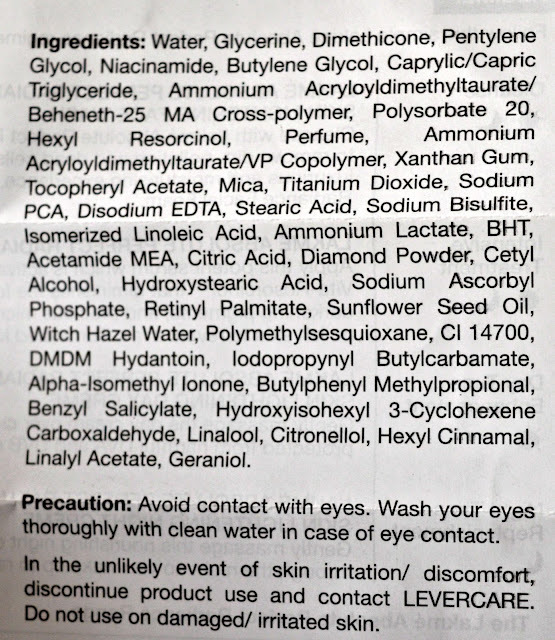 Directions : Twist cap till it clicks open.Pump out twice.Apply dots all over cleansed face and neck.Gentle massage in circular motions. Availability : Available easily in most online stores.You can buy from here. My Experience with the product: This Lakme Absolute Perfect Radiance Skin Lightening serum is launched recently and I have been using this from past 3-4 weeks.I am a big fan of lakme serums and have used their other serums like youth infinity serum and lakme perfect radiance intense whitening serum before,which worked very well for my skin.I have same expectations with this one too and started using this.This is white colored with pearly sheen which turns into light pink when comes into contact with the skin and has a thin consistency.It gets absorbed well but I find it a bit heavy for my skin,may be because of the hot humid climate.My skin has turned into complete oily these days and after applying this serum,I feel that my skin was much oilier then before,so I stopped using it in the morning time and started using at night times and it worked well.It made my skin soft and supple in the morning.But from past 4-5 days,the climate has been changed and it was raining here and I started using it in the morning as well and now it was fine.So, I have mixed opinion with this serum for my oily to combination skin.As per the skin lightening claims,it does made my skin clear but I cannot say it lightened or brightened my skin.Taking the price into consideration,I prefer lakme perfect radiance intense whitening serum over this one! 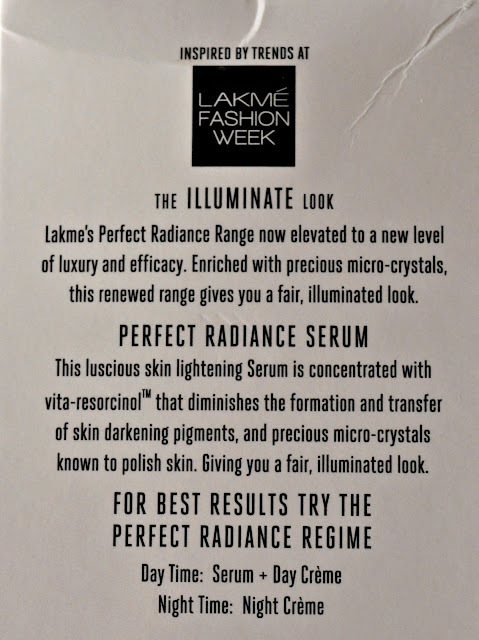 Final Conclusion about Lakme Perfect Radiance Skin Lightening Serum : This serum is good for dry skin people and extreme oily skin people may feel it a bit heavy .It does makes skin smooth and supple but haven't observed any lightening effect so far!!! Labels: Lakme Absolute Perfect Radiance Skin Lightening Serum Review, lakme absolute serum review, lakme new serum review, new launch, perfect radiance serum review.